She should be place in a sanctuary. 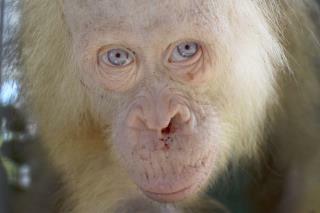 An albino animal's survival chances in the wild are substantially lower than for other animals. She could be mistreated by her own kind, rejected which makes survival more difficult, would be easier to spot by orangutan predators which are tigers and leopards, or easily noticed by humans and hunted/killed for her unique coloring. If captured alive by a human, she'd just be back in the same straights as she was when she was rescued in the first place. Michelle. See how ez that was.